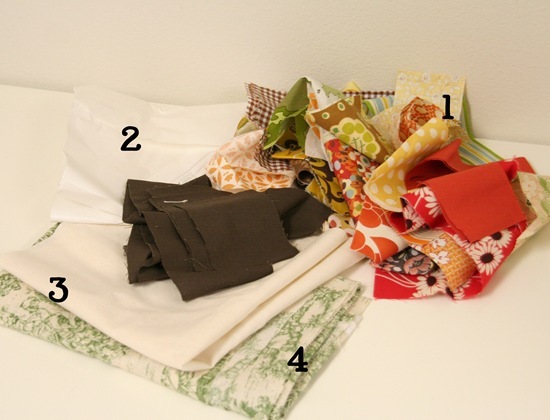 This is my favorite thing to do with my little scraps, and since its Scrap Buster month over at Sew, Mama, Sew, I made a quick tutorial so you can make your own. This pillow cover is 16″ square with an envelope back & the design possibilities are endless! I added some pillows I’ve previously made with this same method at the end of this post. Happy Sewing! 1. Scraps, enough for the tree trunk and the leaves. 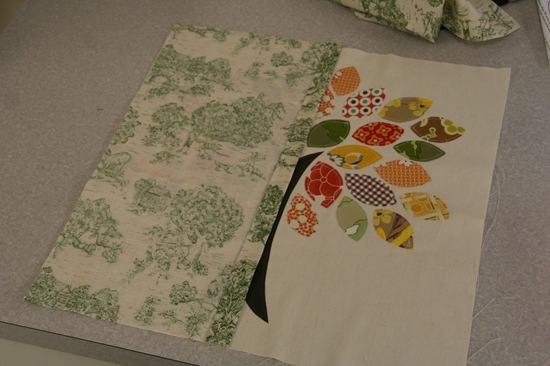 Cutting your scraps into rectangles will make it easier to adhere them to the appliqué material. 2. Appliqué material: I use Heat’ n Bond. 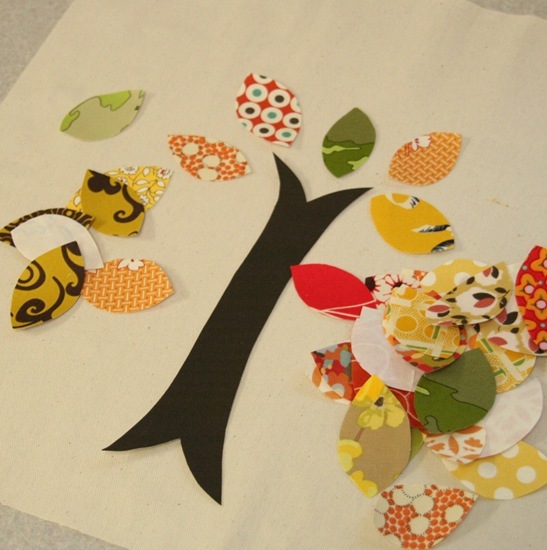 You’ll need about 1/2 yard or more depending on how many leaves you want to make. 3. 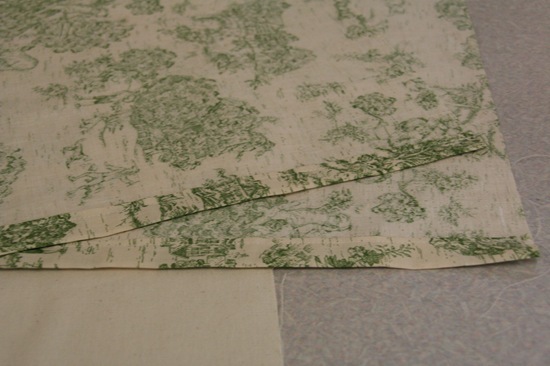 Material for the pillow front, cut to 17″ x 17″ square. I used lightweight canvas and prefer home weight material, but you could use anything. 4. Material for the back. Cut 1 rectangle 17″x 14″ and cut 1 rectangle 17″x 10″. Now with scissors cut out your trunk and leaf shapes. For the trunk I first draw the shape of the trunk on the back of the appliqué material so I get a nice shape, but for the leaves I just free cut as I go. And for reference the trunk on mine is 8″ tall, and my leaves are all about 2.5″ long and are 1.5″ or so wide. When you get all your leaves cut out, tear the backing appliqué paper off the leaves and trunk. I prefer to do this while plopped down in front of the TV cause it takes awhile. :) Or better yet enlist some help. Then you can arrange them how you want on your pillow front. Don’t place any within an 1.5″ of the edges to leave room for sewing. Once your design is how you like it, press with an iron over each spot for a few seconds making sure not to bump anything out of place. This will keep everything in place while you sew them on. Now you can sew either along the inside edges of your leaves, or you can do a zig zag stitch or blanket stitch around the edges if you prefer. I move my foot from leaf to leaf without cutting my strings so it goes faster, then go back and cut my strings at the end. To prepare your pillow back, fold one of the short edges of each pillow backing piece in 1/2″ and press, then again 1/2″ and press and sew to hide any raw edges. These will be the edges of the envelope back. Lay the backing pieces right sides down onto the pillow front over lapping the centers. I placed the smaller backing piece ( 10″ x 17″) down first on the pillow front, but I actually prefer to lay the larger pieces down first since it makes the cover easier to slip on. Either way, make sure your right sides are facing towards the right sides of your pillow front and your outer edges match. Pin around the edges well. Sew with a 1/4″ inseam around the edges, backstitch over the envelope openings for extra strength. After the initial sewing I go around the edges with a serger, pinking shears or a quick zig zag stitch. Its especially important if you are using home weight fabric which tends to fray easily. Then clip your extra corner fabric off so the corners will turn nicely. Then turn it inside out and stuff a 16″ pillow form in it. Here are some pillow covers I previously made if you want more ideas and to see how it looks with the zig zag stitch around the pieces. My favorite dirty quilting secret.. I absolutely LOVE your idea! This is going straight to the top of my to-do list! Thanks for the great tutorial. That is super cute! Guess what's added to my "to do" list?! Thanks for the tutorial and great examples. VERY cute! That's such a great idea! I love this idea. I will have to do some of these. I too just love scraps!!! I LOVE this! I adore your pillows and always wondered how you did it! :) Thanks so much for sharing! I love it!!! It even makes me like fall, which is my least fave season. Happy scraps too. Thanks for the great tute! This is so awesome, I've got a ton of scraps and some tired looking pilow covers. Ohhh, this is so cool! I love your pillows and thank you so much for the tutorial! I think I might make one of these to match my daughter's quilt (from the Red Barn Quilt Along this summer)! Can you tell me roughly how BIG your tree and leaves are?? I have no clue where to start on size. I'm the proud owner of the first of the "previously made" pillows and I get all sorts of compliments on it whenever anyone comes over! Thanks again! Fantastic tutorial. I love the tree image too! I've used it on handmade photo albums for my kids, but on a pillow? That would be divine. Too cute! Thanks for the how-to! Love love love it! I am going to link from my store blog, my customers will love this and will love your blog! What a cute idea. I love it! great job!!! you have fantasdtic scrapps!!! these are so beautiful!! what a great idea…thanks for sharing. These are gorgeous! What great ideas! These pillows are so FABULOUS!! I'll be featuring today! What a cute idea! I might just make one of these this weekend! So stinkin' cute! There goes laundry today! Thanks! Very cute! What a great Christmas gift this would make. I would love to see a tutorial or even just a link on that adorable strip table runner you posted a few months ago. I looked all over the internet and could not find it any where. Just an idea! Thanks, I've been admiring these pillows of yours for a while, I am excited to do one of my own! These pillows are wonderful! Thanks for sharing! Um, Amazing! Love it, and it doesn't look too terribly difficult. Great job! FANTASTIC pillows and tutorial!!! I'm always so inspired when I read your blog! Can't wait to try this out! LOOVE that!!!! thank you for this tutorial!! So! Stinkin'! Cute! I LOVE this pillow! Great tutorial! Thanks! The pillows are gorgeous! These are so cute I can't even stand it! Great idea! The pillows are awesome! I’m thinking Christmas gifts, and new pillows for my bed… oh dear. Thanks for the tutorial! Thanks so much! I love fall and I love trees pluming with leaves so refreshing to look at – your white background is perfect! Thanks for the great tutorial. I'll have to give it a try. By the way, I love your blog! What…omg it's just too cute! And u make it look so very simple. I love it! Wow, this is great! I totally want to make one of these! I'm imagining all sorts of other designs as well…how cool! Thanks. Whoa… I'm blown away by the amount of beautiful handmade creations and tutorials there are here. WOW! I just clicked over from Sew, Mama, Sew! and I'm so glad I did. This pillow is wonderful, it's totally going on my gotta-make-it-list. And I would LOVE to link to some of your tutorials on my blog if you didn't mind. They're fantastic! 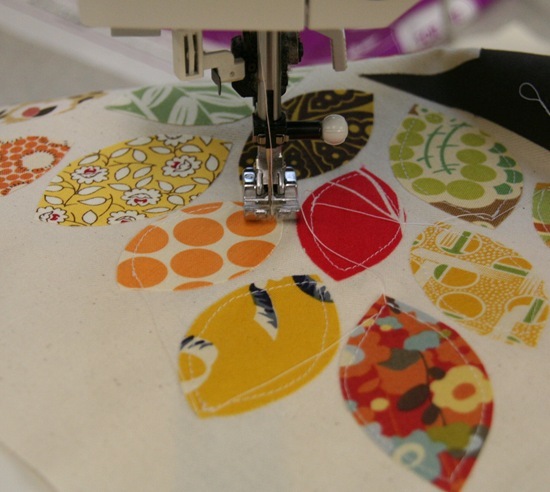 I love seeing how you do all the fabrics on the fusible at once. Saves so much time! Love this! I featured you on my blog, Will you be offering these for sale ? Thank you for the great tutorial!!! So cute! And I LOVE scrappy for so many reasons- this is a great use of even the smallest bits! This is a great technique for fusing those scraps. Thank you! I love this tutorial. It's so great. I have a bunch of new ideas in my head already. Thanks for sharing this with us. I can't wait to get a bit of time to start on my scrappy project. what a great idea! I've got some orange scraps that would love to be leaves on a pillow. Thanks for this! Thank you for sharing your tutorial with us. I went and purchased some wonder under to try this out. I LOVE these! I want to make a set in fall colors and one in spring colors to switch out! Thank you for the fantastic idea! Just beautiful. We are doing a "homemade Christmas" this year and this is a perfect project. Love it! What a great idea. I really like pillows too. Yours is a simply elegant idea. Thanks for sharing. This is just too cute!! Another good use for scraps! those are really really cute pillows!!! hurray for using up scraps! I just went out and bought some applique material. You've inspired me to try it out! coming from this page Hyggelig I'd like to thank you for the tutorial. I have so many scraps left, I will definitely do something like this. So cool. Oh wow! 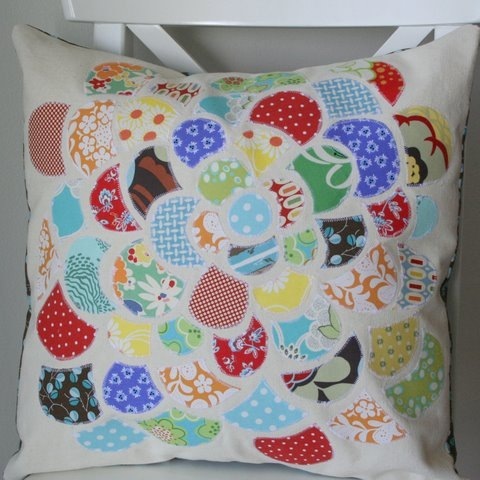 I'm adding this to my list of cushion projects I currently have on the go! gracious sakes alive. in. love. wow! this is fabulous!! thank you! So pretty. 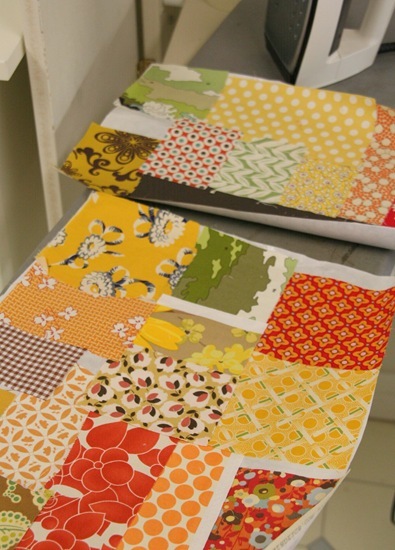 I love your choices of scraps for this project. Adorable. I'm going to run right home and make this. thanks for sharing the tutorial. i set a link. i hope y'll agree. i love your pillows! i've been wanting to do something similar but wasn't sure how to go about it. thanks for the tutorial! LOVE them. They are just like the pillows Anthro was carrying awhile back. Great tutorial – thank you!! oh i love this idea! i really hope to use it someday!!! I couldn't wait to try this technique – I made mine into a wall hanging. I'll post pics on my Flickr, and mention on my podcast. Thank you, thank you, thank you. wonderful way to update a throw pillow for any room! love these pillows! bought some "scraps" today and trying it! thanks cluck cluck! Thanks for sharing this great tut! I've linked your project on my blog..
Really lovely idea! I need some new pillows. Thank you for sharing! My son keeps asking what thanksgiving decorations we have. I am going to make a pillow and tell him this is what we have! Ohhh, I really love this idea. I am looking for applique-style designs to cover these Warm Window shades I am making for the cold weather in our home. This one is very nice…thanks for the ideas and inspiration! What amazing work! I am so going to make one of these cushions. Thank you so much for sharing!! Great tutorial and pictures. I'm definitely going to be making pillows for some christmas gifts! Very lovely idea! I must add this to my neverending list of projects. Thanks for sharing! Found you via SMS, by the way. Super CUTE! I love them! Hi! I just found this tutorial through Sew Mama Sew. What a great idea! A lot of people are going to be getting cute pillows from me for Christmas this year! :) Thanks for sharing. I love this tutorial. 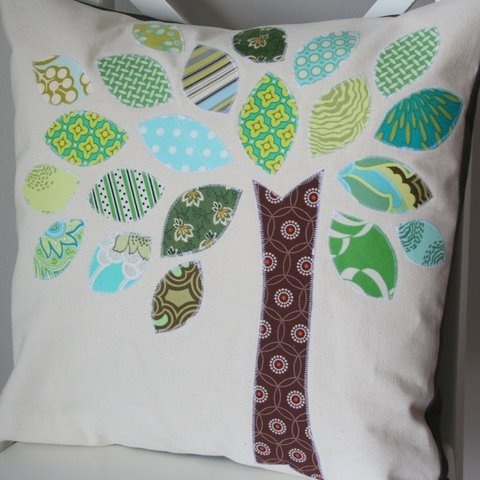 I made my pillow yesterday and I am thrilled with how it turned out (http://sew-handmade.blogspot.com/2009/11/applique-tree.html). Thank you for the great instructions and inspiration! Thanks so much for the inspiration! It got me thinking and I managed to adapt your idea to my tiny little scraps. I think you may have created a monster! I loooove these cusions, I have so much need for a project like this. Thank you so much. Just wanted to let you know that I made one of these pillow shams and everyone loves it. I'll be posting a photo with a link to your site soon. Thank you!! Very cute!! (It helps that I'm a sucker for all things fall regarding decorating.) I linked to this on my weekly roundup – post is here. Congrats on the win! This is great for gift giving too and so much fun to make. I did not find a print link for instructions that would have been real helpful. Allison, this is a great tute! 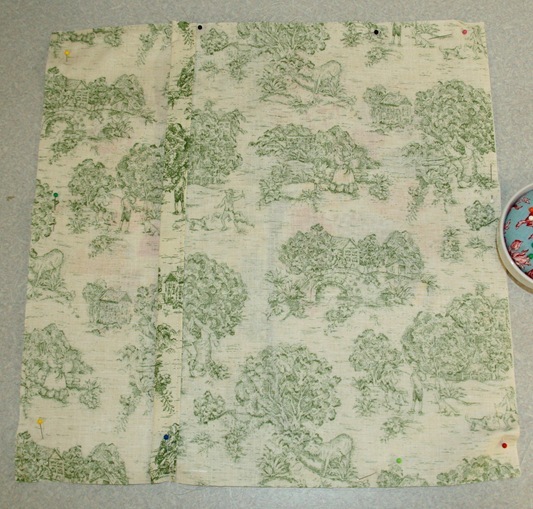 I'm going to post a link to it on my blog "Sewwhattoday.blogspot.com"
I also made this pillow and have posted it! I like these! You have a nice variety too. I'll be posting a link on childmade.com. Thanks for sharing! My daughter and I are making this during our Christmas break. If all goes well, we'll make all four seasons! So beautiful. Thank you for the inspiration … and direction!! Love this pillow, so colorful and fun. Thinking of making a large version for a teenagers bed. This is awesome! My cousin just sent me this, and lo and behold, she was at anthropologie over the weekend and found a pillow for sale that looks just like the flower version you made! we are so excited to try this pattern out! Thank you for the tutorial. I love it. I was wondering how the pillows hold up in the wash (and more importantly in the dryer). Do you have problems with the adhesive coming apart if the dryer is too hot? Excellent design for a pillow, but it doesn't look that comfortable. I mean at least not as comfortable as a Posturepedic mattress, but I guess it is meant to be mostly decorative. I have always wondered what to do with my fabric leftovers…this is a beautiful idea and I am going to do just that.Love the fall cushion idea. 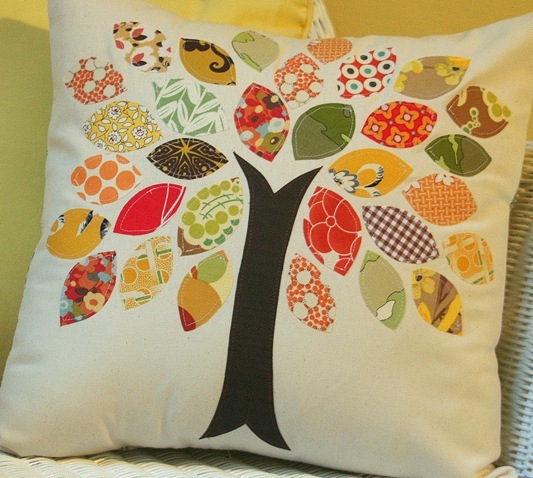 I loved this so much but I turned mine into a family tree pillow. Thanks for the tutorial. IT's a ways down in the post. Love this! I made the tree and then did one with a bird flying. (to represent giving your children roots and wings). This has been on my to do list forever. I need to get to it! Hello! Sorry to hear you have a kidney infection! Hope you recover quickly! I just wanted to send you a link to my post on a pillow I made using this tutorial and also to let you know that I linked back to you! Love your blog! Your quilts are amazing! LOVE THIS! Now to just find the time to do it! Oh my heavens! That's darling. Have to feature it on ziggycrafts.blogspot.com! Thank you for your contribution to last week's linky party. I love these trees! Thank you for the tutorial!! Very good. A new party, at http://www.FineCraftGuild.com/diy-linky-party-21/ will be up shortly. Come feature your new tutorials. We love to see what you've created and be inspired again! amazed with this one, honestly speaking , i want one such tree with all shades of green from one of my kurta tops.. how can i proceed.. what type cloth material i shd use? and all those? Thank you for sharing and having such cute ideas! I made a fall pillow (turned out pretty great) and borrowed your idea for the abstract flower when I made an ipad cover (and added a few green leaves). I smile every time I look at it! Thank you for this tutorial… helped me make some pretty awesome pillows for my home. THANKS!!! too cute for words!! :) love your scraps too!!!! So I'm a little late on commenting on this post lol but this is GORGEOUS! Totally going to have to make these! Thanks for the tute! I LOVE these pillows-I made two of them for spring to put on my living room sofa:) I'm already planning to make more for summer-awesomesauce! This is such a gorgeous design. Thank you so much for sharing! Check out what I did because of your tutorial. It's my first time sewing on a sewing machine ever! Thank you so much!!! I came across your beautiful pillow tutorial through StumbleUpon. So happy to have found your blog! feel free to check it out and grab a button if you'd like! I featured this project at Lines Across My Face in a fall leaf roundup. Love this, found it via 'Very Berry' blog. It's now on my to do list :0) Thanks for sharing! Found you on Pinterest and I made one too! Oh Wow, it's so easy and effective. Thank you for sharing this post. This just made my day! My young daughter found a box in which I had stored an ao dai (traditional dress from Vietnam) that my father had made for me when he was stationed there during the Vietnam war. I was so sad that the dress had been ruined and was looking for a project to do with the remainder of the fabric, which just happens to be orange, green and yellow. I am not very good at sewing… but I think I can handle a pillow. Now, the fabric can be displayed instead of sitting in a box. Thank you so much for the sprocket pillow instructions and template. I had 2 pair of pajama pants that my daughter wore when she was 4yrs old. She is now 27yrs old and expecting her first child. I took the pajama pants and cut them up to make her a sprocket pillow that I will give her for Christmas. Can't wait for her to see it. I know it will be special. I have made two of these pillows from your tutorial and must say they are fun, easy, and very gratifying! You are an angel for sharing these wonderful ideas and instructions with the world. Thank you for the beautiful inspiration and giving this stay-at-home mama concrete reasons for carving out some sweet ME-time. Going to try sprocket pillows later today! Love your cushions especially the trees. Makes me wish I could sew! I love this, looks great and I think that I could maybe even do it! Following you now, would love a follow back! The pillow that you made is beautiful. I love how you used many different patterns to express different leafs. This is such a fun way to bring new life to a classic concept! 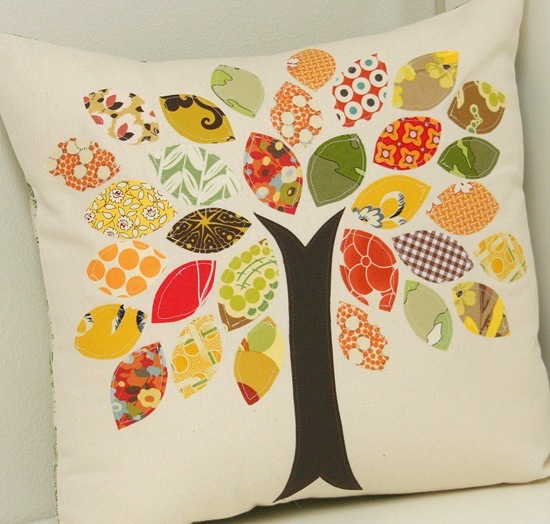 Love the color choices in the Tree Pillow. I am glad to see someone still does the envelope pillows. I do not like the pillows that are sewn closed. What a great way to use up scraps! I LOVE this!!! Thanks so much for this tutorial! 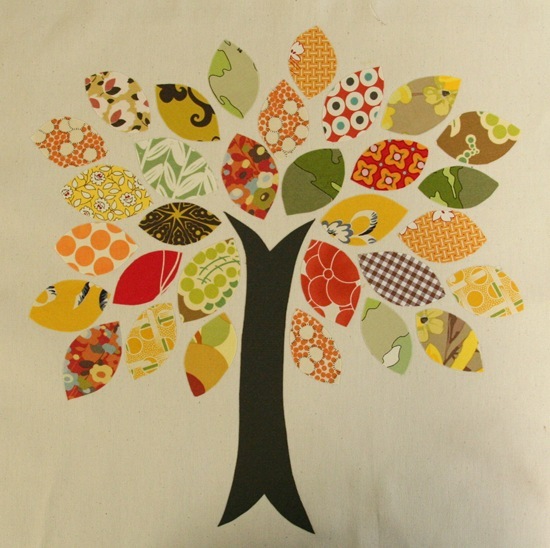 I just finished making one, but instead of different fabrics for the leaves I printed out family pictures on fabric. It's a gift for my mom's 60th birthday and she's sure to love it! Thanks again! We love this idea! My fiance and I are going to cut out leaves and allow for our guests to sign them at our wedding reception. We will then make the pillow out of said leaves for a lovely alternative to a guest book. I love these pillows! I just finished my own over the weekend. They make my sofa look happy. :) I posted a link to this tutorial on my blog. Thank you, Allison! I LOVE THIS SO MUCH! I just inherited my grandmother's sewing machine and I can't WAIT to make something. I think I'll start with these! Sure wish I had the skills to make something this beautiful – love it! Love the scrappy fall tree. I hope to resize for a mug rug, place mat or table runner. Thanks for inspiring. Thanks so much for your tutorial. I love the pictures right along with the instructions. I am a visual learner and need to see what you are explaining when following and learning a new skill set. We are moving to Florida as snowbirds and just bought a house. I will be making these pillows for the couch in the living room and linai.